Today I have made a card featuring the Cottage Cutz Ring Toss and Fish Bowl die. This die is from the Carnival Release. Everything was cut from white cardstock and colored with Copics. The fish with sentiment was cut from the Boys Will Be Boys cartridge. The sentiment is from K. Andrew Designs Art Stamps, Splash-tastic Summer. I also wanted to mention the Halloween Release pre-order is in the store. I know a lot of you have been waiting anxiously for this release, and let me just say, "It is well WORTH the wait!!!" I am so excited! I want them all!! Have a GREAT day and thanks for looking! Soooo cute, Janice! Brilliant idea, and I LOVE all the sparkle!!! 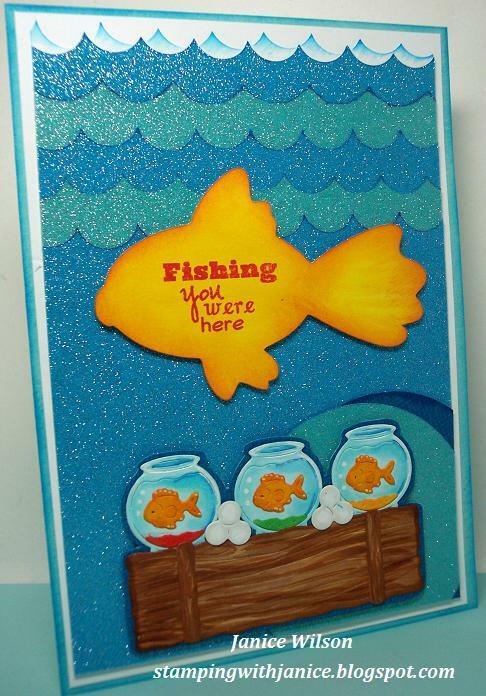 Awwww Your Fishing you were here card is just way too CUTE!!! Love it!!! That is just absolutely adorable! Love all the little fish and the sentiment! Thanx so much for sharing! Awww..so cute! Love those colors together and the glittery paper. How cute Janice! Love the "wave" background. Really a great card! awesome !!! too cute !!!! So stinkin cute...love the sentiment with it...just perfect. Happy Sunday ! - Hi, There! Orchids and Carousels Oh My!! !